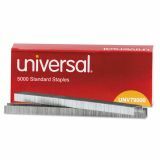 Universal Standard Chisel Point 210 Strip Count Staples, 5,000/Box - Universal Chisel Point staples are the most affordable way to keep your staplers working smoothly. 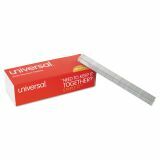 The sharp chisel points at the end of 1/4" legs pierce paper cleanly. Universal staples are made from galvanized steel and sized to reliably work with all standard staplers.